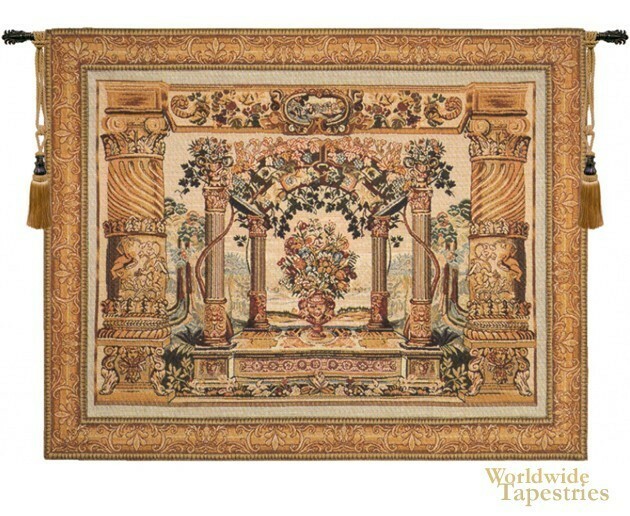 This tapestry Terrasse with Border I is based on an original artwork from Antwerp in the early 17th century. Here we see a terrace scene with elaborate columns representing a beautifully manicured garden, with flora and a central urn filled with flowers. This piece represents an idyllic garden scene from a setting in the 17th century. This tapestry is backed with a lining and a tunnel for easy hanging. Note: tapestry rods and tassels, where pictured, are not included in the price.